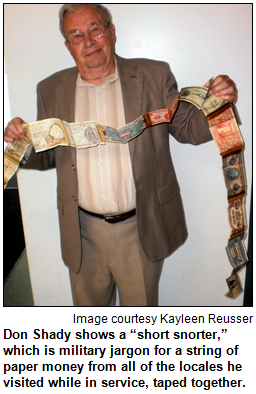 At least once per year, Hoosier History Live tries to showcase the remembrances of Hoosiers who survived World War II. This year, our focus will be on veterans from northeastern Indiana. Nelson's guests will include a 93-year-old Army veteran from Fort Wayne who was involved in the Battle of the Bulge and a 90-year-old Bluffton veteran of the Army Air Corps who helped Polish people freed from a concentration camp. Both veterans are profiled in World War II Legacies: Stories of Northeast Indiana Veterans (Oak Creek Publishing), by Kayleen Reusser, an author based in Bluffton. Kayleen, who has interviewed more than 75 veterans of World War II, will join Nelson in studio. So will Bob Foster of Fort Wayne, who was among the thousands of Allied troops who arrived in Normandy, France, in mid-June 1944 for the Battle of Cherbourg. Six months later, he fought in the Battle of the Bulge, one of the war's most brutal conflicts. 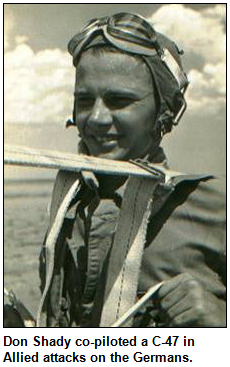 Our guest Don Shady of Bluffton was a pre-med major at Indiana University before enlisting in the Army Air Corps. He co-piloted a C-47 in Allied attacks on Germans, then he was part of a rewarding event at war's end. His crew transported Polish prisoners of war - who had been liberated - back to their homeland from German-held territory. Kayleen's book features the stories of veterans of the Marines and Navy, as well as the Army and Army Air Corps. 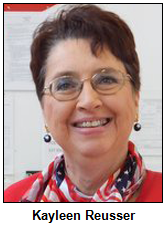 A middle school librarian who has written 12 children's books, she profiles veterans from Wells, Allen, Adams, Huntington and Whitley counties in World War II Legacies. 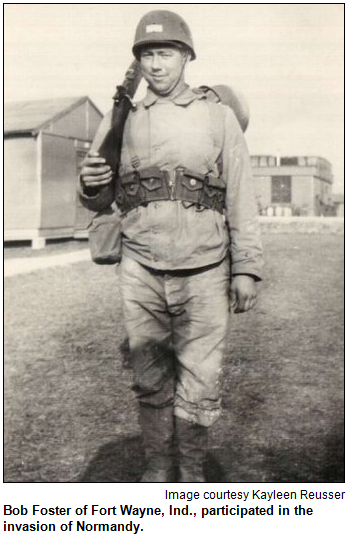 "He and other Allied troops disembarked from Landing Ship Tanks (LSTs) by descending 20-foot ladders into cold water before scrambling toward shore. The troops' marksmanship skills were of little help as they became easy targets for German marksmen on shore." 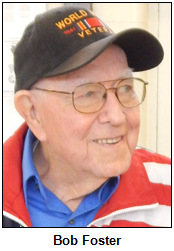 Although Bob Foster survived that conflict, he was injured during the Battle of the Bulge, which unfolded in frigid temps; soldiers fought while sleeping in foxholes filled with snow. Bob Foster also will discuss his role in capturing German POWs. And Don Shady will share insights about the Siege of Bastogne, a battle between American and German forces in Belgium at Christmas time in 1944. During our show, Kayleen will talk about common themes among the Hoosier veterans, such as their youth when they were dispatched overseas. Many were just 18 or 19 years old. "Someone who would have been in his early 20s," she notes, "might have been called the 'old man'." Her book features an account by an Army Air Force veteran from Fort Wayne who had to evacuate his plane over occupied France. He was hidden for three months by farmers in the French Resistance movement. During a show last year, we focused on insights from veterans featured in another book, World War II: Duty, Honor, Country (iUniverse). Our guests included Noblesville resident Merrill "Lefty" Huntzinger, a staff sergeant in the 2nd Infantry Division who landed on Omaha Beach a few weeks after D-Day. Last August, about seven months after our show aired, Lefty passed away at age 90. Here is our enewsletter for that Jan. 11, 2014 show. 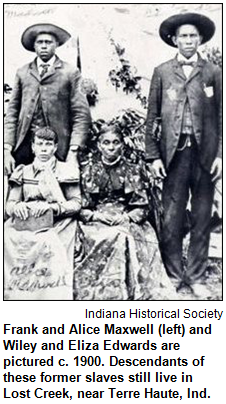 Guest Roadtripper Dona Stokes-Lucas, genealogist and co-chair of Indiana Freedom Trails, says that Lost Creek in Vigo County near Terre Haute was one of the "crown jewels" of her further discovery of early African-American settlements in Indiana. Dona tells us that Vigo County was formed in 1818, and by the 1820 census there were already 26 free blacks living in the county. The population of free blacks in the county continued to rise; 425 in 1840, 748 in 1850, 706 in 1860 (a slight decrease) and 1,099 in 1870. In 1850, there were 41 black landowners, whose real estate was collectively valued at $37,850. An AME church was established by 1840 in Lost Creek, and a Baptist church was organized by 1850, an organization that still holds services today. Two of the African-American cemeteries remain in Lost Creek: Roberts and Stewart Lawn. Descendants of these black pioneers still live on the same land, some for more than 150 years. Lost Creek Settlement descendants Dorothy Ross and daughter Dee Reed live on a homestead there that has been recognized by the state as a "Hoosier Heritage Farm," and they maintain an impressive archive and records of their family history. They also helped to organize the Lost Creek Community Grove Restoration and Preservation Foundation. Dona was one of several researchers participating in the Early Black Settlements initiative, which has documented 61 early farming communities in 43 counties in Indiana. Some of the better-known communities are Lyles Station in Gibson County and Roberts Settlement in Hamilton County. You can click on this interactive map to learn about early black settlements in your county. The Early Black Settlements initiative was funded by Lilly Endowment. One of the few remaining World War II battleships called LSTs - for Landing Ship, Tank - has been docked at an Indiana city in recent years. 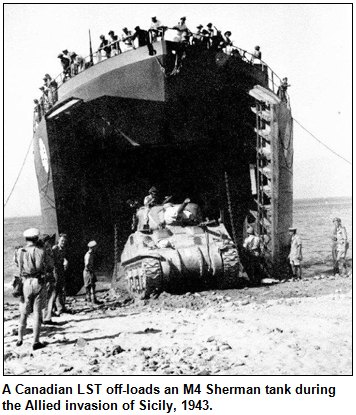 LSTs were designed to land tanks, soldiers and supplies directly onto enemy beaches so they were instantly ready for battle. The LST docked at the Hoosier city participated in several operations, including D-Day at Omaha Beach. One of only two of the naval landing ships from the war to be preserved in this country, the LST at the Indiana city is a museum and memorial for those who served aboard them. Question: At what Indiana city is the LST docked? The call-in number is (317) 788-3314, and please do not call in to the show until you hear Nelson pose the question on the air. Please also do not call in to the show if you have won any prize from WICR in the last two months. The prize pack is a gift certificate to Story Inn in Brown County, courtesy of Story Inn, and a pair of tickets to the Indiana State Museum, courtesy of the Indiana State Museum. Your donations help keep Hoosier History Live on the air, on the Web and in your inbox! A former Greyhound bus station in Evansville. A historic German church in Cumberland with an unknown fate that's making headlines. The long-ago City Hall of Indianapolis. And a bridge over the Wabash River near New Harmony that spans Indiana and Illinois - and is the focus of governmental squabbling over responsibility for the structure. Those landmarks will be on the "menu" when Nelson welcomes Marsh Davis, president of Indiana Landmarks, the statewide historic preservation organization, as his studio guest. 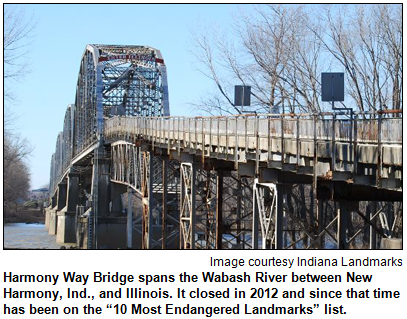 Some of the landmarks in our spotlight have been featured on past or present 10 Most Endangered lists that Landmarks complies annually about historic structures across the state whose fate is in jeopardy. With other landmarks, an ideal (or practical) use for them - including the majestic, 105-year-old building that served as City Hall in Indy until the 1960s - has been debated for years. This week, city leaders announced the Neo Classical building (at the corner of Alabama and Ohio streets) will become the lobby of a boutique hotel. Nelson will seek insights and reactions from Marsh Davis, a native Hoosier who has led Landmarks since 2006. For years before that, Marsh was a staff member at Landmarks - with an interlude as the leader of historic preservation in Galveston, Texas. In Evansville, the Greyhound terminal opened in 1939 and is considered a rare survivor of the bus company's "blue period" in which the exterior matched the color of its buses. In 2007, Greyhound moved out of the terminal, which was designed with curved corners and parallel lines to imply speed and movement. St. John's United Church of Christ in Cumberland - a town that straddles Marion and Hancock counties - was built on the National Road (Washington Street) in 1914. The German heritage congregation inspired the name for German Church Road, the cross street. News accounts have been describing the controversy involving the decaying church and its dwindling congregation, which has had various purchase offers for the structure. Historic preservationists have objected, noting potential purchasers would demolish it. Harmony Way Bridge, which was built in the 1930s and leads from historic New Harmony to Illinois. It was declared unsafe and shut down in 2012. Since then, various state and county commissions - as well as transportation officials - have declined to accept responsibility for the bridge.